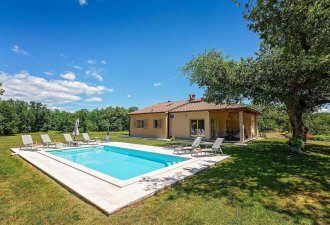 Villa Paola is a renovated old istrian stone house located on an isolated spot in the surroundings of Krsan on the eastern part of Istria, 7 km from the sea, 13 km from Labin and 18 km from Rabac and its lovely pebble beaches. The house is situated on a 6.400 sqm enclosed property on which you'll find a private pool, covered terrace with barbecue and a large table for dining on the open air, volleyball/badminton playground, two swings, a small fitness room and parking places for 6 vehicles. One part of the property is not at guests' disposal while here lives the owner's friendly donkey. The facility consists of two units with separate entrances. The smaller, air-conditioned unit consists of an equipped kitchen with dining table, two two-person's bedrooms of which one with a double and one with two single beds, shower/toilet. The 2nd unit is on two floors. On the upper floor there's a spacious and air-conditioned living room with open fireplace, SAT-TV and one-person sleeping couch, fully equipped and air-conditioned kitchen with dining table, one two-person's bedroom with double bed, one bedroom with bunk beds, one one- person's bedroom, shower/toilet with washing machine and a separate toilet. On the lower floor there's a tavern with equipped kitchen and a large dining table and one shower/toilet.